Sean Dyche feels his players have to shoulder the responsibility of higher expectations. Burnley have suffered four-successive Premier League defeats, as they sit bottom of the table with a point. 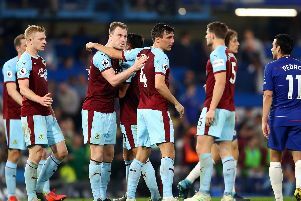 After finishing seventh last season, earning a place in the Europa League, the Clarets’ start to the season has come as a surprise to many. But Dyche believes his players will begin to show why they were the best of the rest last term, and said: “We’ve got to lift that fog - some of it is from work, some of it from mentality, and some from that inner belief. “The facts are the facts, and I told them after the game, they’re now recognised. “Every year its been ‘little old Burnley’, underdogs, but they’re now recognised because of last year. “You have to grow with that responsibility - it’s actually something to be enjoyed. “Some of these players have been fighting, year on year, to show the world ‘I’m a good player’, well then enjoy that moment, take on the responsibility that comes with that. “Continue to show the world what a good player you are. Dyche feels there has been a number of factors behind the start - a disappointing transfer window, injuries to key players and European commitments, but he added: “The window was tough, simple as that. “We were hoping to bring in more bodies to affect it, freshen it, but behind that, there’s a group of players who should be thinking ‘good, I’ve got a better chance of playing’. “I’m not going to hide behind that, it is a fact we were in for about three more players and didn’t get them, same as it’s a fact with Steven (Defour) and Robbie (Brady), who have been terrific for us last season, so we want them to come back fit and that gives us more options and more guile, more effectiveness hopefully in attack. But that is good fuel for a player playing now, if they’re coming back soon, they’ve got to play. One man currently performing well is England keeper Joe Hart, who, despite picking the ball out of his net 10 times in five games, has made more saves than any other keeper in the Premier League so far this season. Dyche said: “I don’t think he’s got anything to prove, he might feel he has himself, I don’t know, I’ve not really spoken to him about it. “I certainly don’t think so. We have a great situation with Tom Heaton, who’s a fantastic pro and keeper and continues to be so, Popey will recover at some point, and Joe Hart.